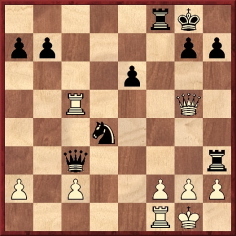 Black played 23...Qg3, and White resigned. That sounds decidedly less colourful than ‘showering’. On the other hand, Al Horowitz’s All About Chess (New York, 1971) gave the game twice (on pages 63 and 150), each time with a denial, based on a statement by Marshall’s widow, that any gold had been given (‘... Caroline Marshall, who ought to know, disclaims knowledge of even a shower of pennies’). On page 204 of Frank J. Marshall, United States Chess Champion (Jefferson, 1994) A. Soltis asserted that this was ‘the best explanation of what actually happened’. He also reported that Marshall’s original handwritten notes to the game merely commented, ‘A purse was presented to me after this game’. We wonder whether a reader can discover more details in the local press. 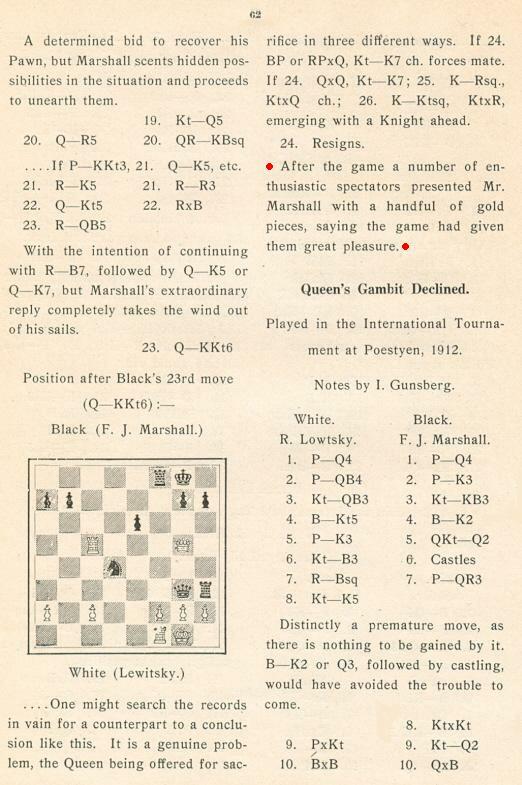 The tournament book states that the game was played on 20 July 1912. On page 107 of his book Chess Lists (Jefferson, 2002) Soltis wrote similarly about Marshall’s notes. There was no forced mate. 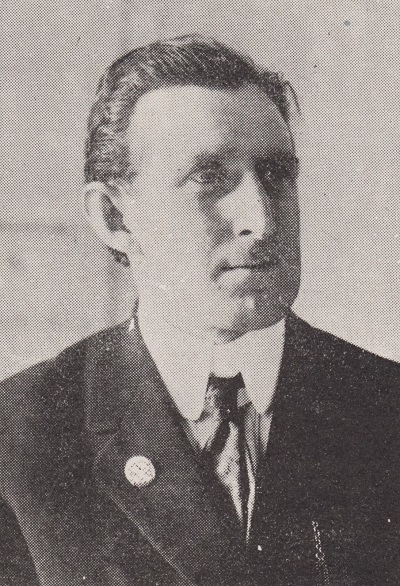 ‘As Owen Hindle observed in C.N. 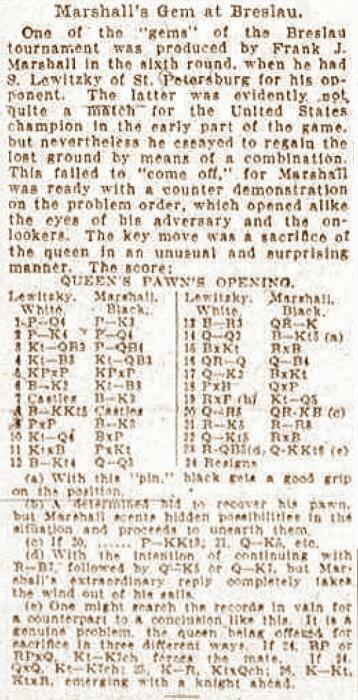 2148, pages 61-62 of Marshall’s Chess “Swindles” stated that the book’s notes to the Levitzky v Marshall game were reprinted from the Brooklyn Daily Eagle (without any date being given). 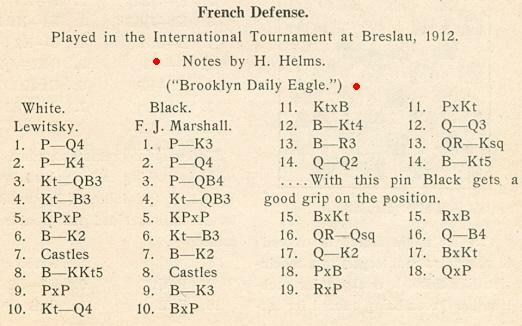 Marshall’s readers were left to assume that the key words at the end (“After the game a number of enthusiastic spectators presented Mr Marshall with a handful of gold pieces, saying the game had given them great pleasure”) had been written by Hermann Helms, the chess editor of the Eagle. 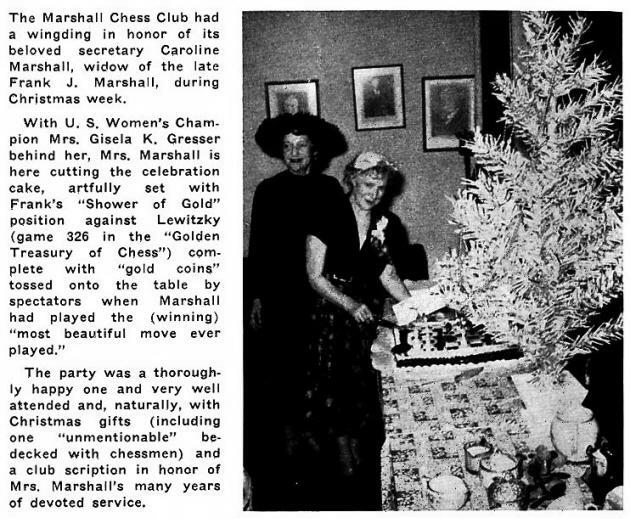 Thus, the comment about gold on page 62 of Marshall’s Chess “Swindles” seems to be an addition by Marshall himself. The game was also published in the New York Sun, 18 August 1912, page 8, with annotations but no gold coins story. 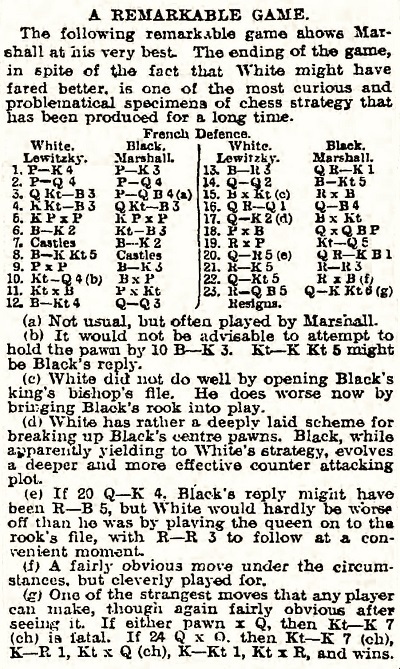 The score appeared too in the New York Evening Post of 21 August 1912 with Emanuel Lasker’s annotations, in a report from Berlin dated 9 August. Lasker made no mention of gold. Latest update: 2 April 2019.